Rajkumar Hirani was accused of sexual harassment by a woman who worked in his company, during the during the post-production of blockbuster ‘Sanju’. Many noted names in Bollywood has been exposed in the #MeToo movement such as Nana Patekar, Sajid Khan, Alok Nath and the recent name to join the list is filmmaker Rajkumar Hirani, whose last film Sanju shattered records. Hirani is accused of sexually abusing a woman was employed under him on more than one occasion over a six-month period between March and September 2018. “My mind, body and heart were grossly violated that night and for the next 6 months,” the girl has been quoted as saying in Huff Post India. “Because if Hirani said I wasn’t good, everybody would listen. My future would be in jeopardy” the woman told HuffPost India. “I was completely shocked when these allegations were brought to my notice about two months back. I had suggested immediately that it is essential to take this matter to any committee or any legal body. The complainant has chosen to go to the media instead. 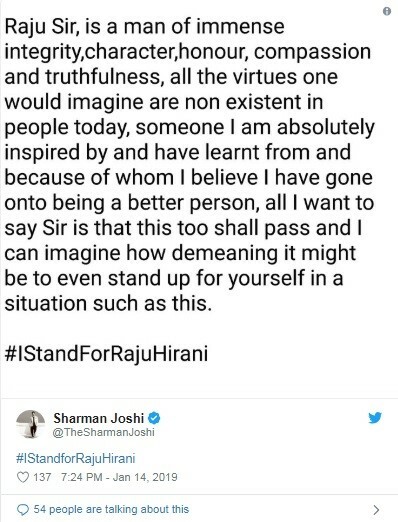 I want to very strongly state that this is a false malicious and mischievous story being spread with the sole intention of destroying my reputation,” Hirani’s statement read. Sharman Joshi tweets his support for his ‘3 Idiots’ director in all the right note. Film producer Boney Kapoor said he is shocked after hearing the accusation. Speaking to ANI, he said, “Rajkumar Hirani is too good a man to do something like this. I don’t believe this allegation. He can never do something like this." Dia Mirza, who starred in Mr Hirani's 2006 film ‘Lage Raho Munna Bhai’ and in 2018's Sanju, defended the filmmaker and told news agency PTI: “As someone who has known and respects Raju Sir for 15 years I can only hope that a due official enquiry is conducted. He is one of the most decent human beings I have ever worked with and I think it would be grossly unjust on my part to speak on this as I do not know the details,” the actress said. Hirani’s work is hugely affected by this allegation, whereby his name was dropped from the posters of his forthcoming film ‘Ek Ladki Ko Dekha Toh Aisa Laga’ after he was called out as a sexual predator. There’s also news that the much-awaited Munnabhai 3 has also been put on hold till he gets a clean chit.